How do insects cope in a heat wave? Everyone hopes for good weather but when we experience a heat wave it’s not long before we start to flock back indoors to welcome the cooler shade. And insects are no different. As insects are cold blooded they thrive in warmer weather. Mild springs can lead to an increased population due to insects breeding earlier in the year and more frequently thereby reducing the time between generations. Even though insects prefer warmer weather they can adapt to cope in a heat wave just like humans. Their first instinct is to find a shadier spot to cool off. Where better than inside our homes in a quiet nook or cranky? Insects seek out such spaces as a way to evade extreme environmental changes – to reach a more acceptable equilibrium if you will. You may not realise insects have commandeered your corners because the hot weather can cause them to become dormant during the daytime. 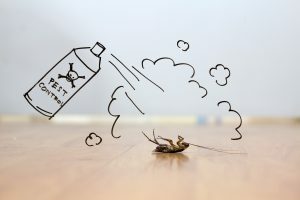 Although you may never completely prevent insects from entering your home, there are a few simple steps to take to avoid becoming the next bug guesthouse during the hotter seasons. In a nutshell, never leave food and liquid lying around or left open and therefore prone to insect infestation. It can only take between eight to 20 hours for maggots to appear! It should be easy to cope with changing behaviours and to keep insect pests in the home at bay during a heat wave. If you feel as though you have a serious problem, for whatever reason, call the Pest Busters team on 0800 035 1000 today.